The development of the world, and of scientific discovery, is highly contingent on the actions of individual people. The Irish-born John Tyndall (c. 1822–93), controversial scientist, mountaineer, and public intellectual, nearly emigrated to America in his early 20s, like so many of his fellow countrymen. Had he done so, the trajectory of nineteenth-century scientific discovery would have been different. The histories of magnetism, glaciology, atmospheric science, bacteriology, and much more, would be altered. The Tyndall Effect and Tyndallization would be unknown terms. There would be no Mount Tyndalls in the Sierra Nevada or Tasmania, no Tyndall glaciers in Colorado, Alaska, or Chile, and no Tyndall craters on the Moon or Mars. The Pic Tyndall, on the Matterhorn, would carry another name. The Tyndall Centre for Climate Change Research in Norwich, England, and the Tyndall National Institute in Cork, Ireland, if they existed, would have different names. In 1844, the young John Tyndall planned to sail on the Thomas P Cope out of Liverpool, to join friends and relatives in Ohio, and to seek work as a draughtsman or surveyor. That he did not go was due to the last-minute possibility of bidding for a surveying contract in Ireland. Though he was unsuccessful, the moment had passed. Tyndall is one of the fascinating and intriguing figures of the nineteenth century. An outspoken physicist and mountaineer, who rose from a humble background to move in the highest reaches of Victorian science and society, and marry into the aristocracy, his story central to the development of science and its place in cultural discourse. He was one of the most visible public intellectuals of his time, bridging the scientific and literary worlds. He was one of the most visible public intellectuals of his time, bridging the scientific and literary worlds. In scientific circles, he is best known for his research on the absorption of heat by gases in the atmosphere. Through this work, he set the foundation for our understanding of climate change, weather, and meteorology. Among much else, he explained why the sky is blue, how glaciers move, and helped establish the germ theory of disease. Beyond that, he was a pivotal figure in placing science on the cultural and educational map in mid-century, and in negotiating its ever problematic relationship to religion and theology. His iconoclastic speeches and writings sent shockwaves through society, not least in religious circles. With friends such as Michael Faraday, Thomas Huxley, Charles Darwin, Rudolf Clausius, Hermann Helmholtz, Emil du Bois-Reymond, Thomas Carlyle, and Alfred Tennyson, he was at the heart of nineteenth century thought. In the event, Tyndall did visit America, but not until 1872, when—as one of the most prominent scientists and public figures of his time—he made a famous lecture tour, formally instigated by Joseph Henry, Secretary of the Smithsonian Institution. Stellar figures like Ralph Waldo Emerson and Louis Agassiz added their names to the invitation. The tour took in six American cities: Boston, Philadelphia, Baltimore, Washington (where President Grant himself attended), New York, Brooklyn and Newhaven. Interest and demand was high in all the venues, and Tyndall’s lecturing and demonstration style was a revelation. Tyndall was well-known in America, even before his visit, through his popular writings, covering science, mountaineering, and the boundaries between science and religion. Indeed, his reputation was such that he found himself better known in Philadelphia than in many English cities. Demand for reprints of his lectures—a series of six on the theme of Light—was huge. Printed by the New York Daily Tribune, some 300,000 were sold across America. Tyndall came to America determined to give the Americans a piece of his mind. He used the lectures, about the fundamental physics of light, to convey a broader message about the need to support scientific research for its own sake, untrammelled by demands for immediate application. In his view, the Americans were neglecting this vital element, and were instead drawing their ‘intellectual treasury’ from England. To his credit, Tyndall put his money where his mouth was. He had determined that he would make no personal profit from the American visit. Instead, having published his full accounts, he invested the surplus of $13,033.34 to set up a fund that his cousin Hector Tyndale (a Brigadier-general in the recent Civil War) referred to as the Tyndall Trust for Original Investigation. The investment flourished, and in 1884 Tyndall decided to divide the sum equally between Columbia College, Harvard and the University of Pennsylvania, creating three Tyndall Fellowships. The scholarships ran for several decades, and until the 1960s in the case of Harvard, but no longer appear to exist. Featured image credit: Professor Tyndall lecturing at the Royal Institution courtesy of the Royal Institution of Great Britain. Roland Jackson is a historian of science, with interests also in contemporary science and innovation policy, and in bioethics. His recent posts include: Head of the Science Museum, London; Chief Executive of the British Science Association; and Executive Chair of Sciencewise. Jackson is a General Editor of The Correspondence of John Tyndall, being published in 19 volumes by the University of Pittsburgh Press. 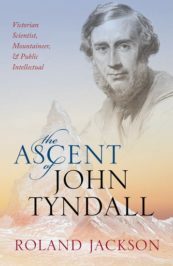 He is the author of The Ascent of John Tyndall: Victorian Scientist, Mountaineer, and Public Intellectual, published by Oxford University Press. Am I missing something? There is a Tyndall Centre for Climate Change research based at the University of East Anglia! Also a Tyndall Centre at the University of Manchester. And I thought it was Svante Arrhenius, that first to uncover the secrets behind Earth’s atmosphere? As for germ theory, I thought that was Louis Pasteur? Indeed! The University of East Anglia is in Norwich. And the network of the Tyndall Centre does include Manchester (and others). There is a lot of atmospheric science before Arrhenius (see e.g. James Fleming’s Historical Perspectives on Climate Change). Pasteur was Indeed central to a germ theory, in which Tyndall played a significant role. All in the book!